There are many reasons why you might need a fence, and with all the styles and materials it can get a little overwhelming to choose what is right for you. Roots Landscaping has been serving Greater Danbury since 2000 and has the experience to help you make the best decision for your home. Whether you need a fence to keep your dog in your yard, a way to separate your garden from the rest of your property or a fence around your pool, a new vinyl fence can help you achieve your goal while looking great and being easy to maintain. Vinyl is a great option when thinking about a new fence for your Danbury yard. There are a large variety of styles and options to choose from, and while not the least expensive option, vinyl gives you the benefit nearly no maintenance required. Vinyl doesn’t need to be painted and isn’t susceptible to molds due to moisture, also because it’s plastic, it doesn’t rust or rot. If the fence becomes dirty, a simple wash with the hose or some soapy water will clean it up perfectly. 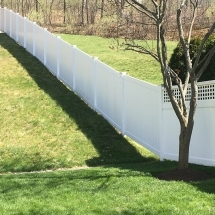 When a quality fence is needed around your home, as stated, vinyl is a great option, especially in the Danbury Connecticut area. Connecticut has so many different weather patterns between frost and snow, rain and humidity and everything in between it makes it easy to choose the easy to maintain vinyl option. You never have to worry about your fence rotting or rusting, and when it needs to be cleaned, you can either spray it down with a hose or let the next rain shower wash away the dirt. Whichever option you choose, Roots Landscaping will make sure your vinyl fence looks great and fits perfectly with your home. Roots Landscaping of Greater Danbury offers a variety of materials and styles for you to choose from. We can recommend styles and materials based off your existing landscape and what look you’re trying to go for. While we love all our options, there are definitely pros and cons to each material. While wood is a less expensive option over vinyl, wood does require seasonal upkeep. Unlike vinyl, wood has to be sealed and repainted or stained from time to time. Vinyl does expand and contract with the change in temperature, but it will never splinter, or require repainting or staining. Both options are good for a variety of fencing needs such as privacy fencing, property markers, or dog fences. No one can deny that a wrought iron fence looks classic, beautiful and is highly durable, but if you’re looking for a privacy fence or a dog fence, vinyl would definitely be the better choice for your Danbury home. However, if you’re looking for a pool fence and want that classic look, a wrought iron fence may be the way to go. While fencing costs for both materials have gone down as the need for fencing rises, a vinyl fence is definitely the less expensive option and still looks great. Chain-link fences are definitely inexpensive and also have the added bonus of being durable and maintenance free. However, unlike a vinyl fence, chain-link is very limited in styles and offers your yard no privacy. Vinyl is also durable, like chain-link, and maintenance free, but offers many more styles to choose from. The installation process depends entirely on the structure of your Danbury lawn. First, the desired path must be chosen, measured and any items in the way of the fence, such as shrubbery, must be removed. Once this is done, holes will be dug for the posts typically 24″ deep and about 10″ wide. Then cement is poured in around the posts to keep them from moving during the freeze and thaw cycle of Connecticut. After the cement has dried and hardened – which can take between a few hours up to a day – the rest of the fence can then be installed. Whether the fence is for privacy, pets, or property markers, Roots Landscaping will make sure your new vinyl fence is the envy of your neighbors. Regardless of the fence style you want, Roots Landscaping can help you achieve your desired goal with a great new vinyl fence for your Danbury home. We specialize in all styles of vinyl fence and have the experience needed to get the job done right! Call us today to talk about your choices for a new vinyl fence. 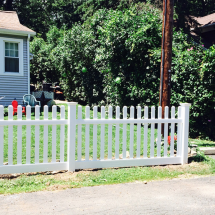 Roots Landscaping is your local fencing company providing residents of Greater Danbury, CT with vinyl fence repair services. We provide a free estimate for vinyl fence repairs, whether it be a small hole in your fence or an entire damaged section. Our fencing experts help you to determine whether your fence needs to be be repaired or replaced. We repair posts and fence foundations. Roots Landscaping provides top-rated service and is accredited by the BBB standards. To learn more about how we can help you with your Vinyl Fencing needs, or if you’d like to learn more about our Danbury area company, services, and team contact Roots Landscaping today.